While it’s true that zoning restrictions in San Marino, California have largely made this exclusively a residences-only community, that is not to say it is an isolated world with nothing going on. Situated south of Pasadena, north of San Gabriel, in between Alhambra and Caltech, and about 12 miles from downtown Los Angeles, San Mariners are venturesome, connected and on the move. 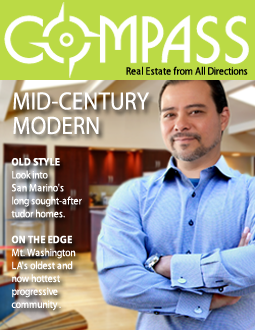 That said, anyone who values well-kept gardens and sumptuous parkways can easily call a place like San Marino home. Zoning requirements dating back to the 1920s keep lot dimensions large relative to home sizes; the smallest lots are 4500 square feet and some are as large as 30,000 square feet. This creates an abundance of open space that is increasingly rare in southern California. The most distinct homes are the work of prominent architects (Robert D. Farquhar, Wallace Neff, Buff & Hensman, Robert Orr, et al. ), one of which listed for $17 million in 2013. The median home price in 2013 was $1.525 million (there are no townhouses or apartments in San Marino), with prices ascending in 2013 at a rate (32.1%) faster than the California averages. The median household income in San Marino is $143,000 per year. When you live in San Marino, you have the world nearby. In nearby Pasadena, it’s a short trip to visit the Armory Center for the Arts, Kidspace Children’s Museum, Norton Simon Museum and the Pasadena Museum of Art. For an exotic dinner, San Gabriel has almost unlimited restaurant selections. The wealth of arts institutions, restaurants and recreational facilities of Los Angeles are easily accessible. San Marino High School achieves high scores as do middle and elementary schools within the San Marino Unified School District. The list of residences on the market in San Marino is perennially short. If you are interested in looking at homes here or elsewhere in Northeast Los Angeles, contact Steve Aranda at 360 Real Estate Group. Steve has represented buyers and sellers in San Marino area for more than 13 years.